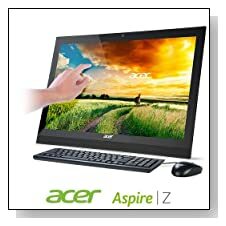 Acer Aspire AZ1-621G-UW11 is an entry level 21.5 inch Full HD All-In-One touchscreen Z1 series desktop computer with adequate power, speed and performance for daily tasks and a bit more, attractive design, good set of features and ease of use at a very low price, being a certified refurbished unit. As a ‘manufacturer’ certified refurbished product it is not likely to show any signs of use and includes all the original accessories and a 90-day limited warranty (versus 1 year on brand new models). Acer Aspire AZ1 has the quad core Intel Celeron N2940 processor (2MB cache and with a Passmark benchmark score of 1734 ‘low mid-range CPU’ as of now) at 1.83GHz up to 2.25GHz with turbo boost but no hyper threading as it already has four cores, 4GB DDR3L SDRAM for good level of multitasking (ability to run a few apps and browsers simultaneously) at this level, 500GB SATA hard drive at 5400 rpm rotating speed as average size and speed storage but plenty for majority of customers and Genuine English Windows 8.1 64-bit operating system. Windows 10 is coming out soon and you will be eligible for a free upgrade as an existing Windows 8 user. 21.5 inch FHD resolution LED-backlit touchscreen with 1920 x 1080 pixel resolution is a high quality sharp and bright screen with fine details and awesome visuals that supports 10-point multi-touch gestures and lets you control light games and other multimedia stuff and apps. Intel HD graphics (Bay Trail) with shared video memory will let you edit photos and simple multimedia. The built-in front facing two stereo speakers and subwoofer offer great quality very clear immersive sound with deep bass for music and videos, and has an integrated high definition webcam with 720p resolution to chat with friends and family on Skype. 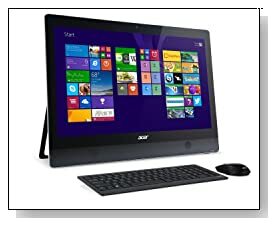 Acer Aspire weighs just under 11 pounds and measures 20.71 x 13.46 x 1.18 inches- is fairly slim and helps save on space on your desk and in the room and is easy to move around in your house or office. It comes with a decent wireless keyboard and mouse as well as a good range of connectivity options including 802.11bgn wireless, Bluetooth 4.0 to use other Bluetooth enabled devices like printers and speakers wirelessly, 10/100/1000Mbps Gigabit Ethernet with RJ-45 for fast wired internet access, SD Memory Card Reader, HDMI output to view your stuff in HD quality on large screen TV, 3 x USB 2.0 ports (no USB 3.0) and an Audio jack. Conclusion: Z1 series Black Acer Aspire AZ1-621G-UW11 is an entry level but good desktop computer with the quarter three 2014 release energy efficient quad core Celeron processor with sufficient power (better than previous Intel Atom’s) for light games, multimedia, web browsing, Microsoft Word and Excel and multitasking with 4GB memory but not advanced gaming or complex multimedia. It is functional, easy to set-up and use- user friendly, has great looks, decent performance and nice features for the low price tag partly because it is a certified refurbished product that looks like brand new and the warranty is for 90 days (at least you are getting one!). 21.5 inch size is plenty of screen space and it is Full HD with touch function and it is tiltable for viewing comfort. There is no optical drive as most of the stuff is downloaded off the net these days and USB parts are only the 2.0 variety and not USB 3.0 with faster data transfer speeds. Intel HD Bay Trail GPU on this computer is OK for general multimedia and light gaming (World of Warcraft at very low settings only) but not for the more demanding titles of 2014 and 2015 and the TDP is rated at 7.5 watts so the energy consumption will be minimal. It is offered with trial versions of McAfee Internet Security and Microsoft Office and 12 month parts and labor warranty. You’ll find the AIO system, power cord, Quick Start Guide, Acer wireless keyboard and mouse in the box.